On May 27, 2015, the U.S. Food and Drug Administration (FDA) approved the Humalog U-200 KwikPen, containing the first concentrated mealtime insulin analog to receive the green light from the agency. 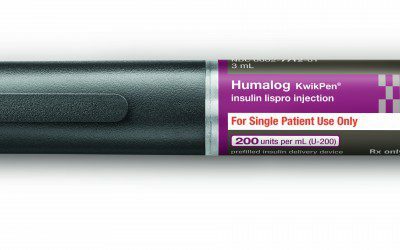 The Humalog U-200 KwikPen, which is approved for blood sugar control in people with Type 1 and Type 2 diabetes, is a prefilled insulin pen containing a double-strength formulation of the rapid-acting insulin Humalog. The pen holds twice as many units of insulin as the U-100 version (600 units versus 300 units) in the same 3-milliliter cartridge, allowing for fewer changes each month, and also provides the same dose in half the volume of the U-100 formulation. The Humalog U-200 KwikPen can be dialed in one-unit increments up to a maximum of 60 units per injection. The pen is scheduled to hit the shelves of U.S. pharmacies in August 2015. No pricing information is currently available. Once open, Humalog KwikPens should be thrown out after 28 days, even if insulin remains. The most common side effect of Humalog insulin is low blood sugar. For more information about the Humalog U-200 KwikPen, see the press release on the Eli Lilly website or the patient information sheet. If you’re a Native American who lives in the area of Santa Rosa, California, you’ll want to check out the upcoming “Taking Control of Your Diabetes Conference & Health Fair.” Bookmark DiabetesSelfManagement.com and tune in tomorrow to learn more.